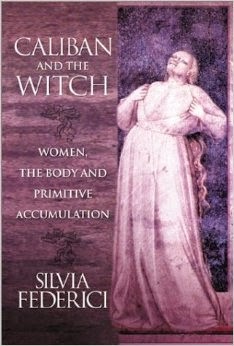 Dear Friends: I have just finished reading Caliban and the Witch by Silvia Federici. This book examines European history in the 14th through the 17th centuries and the conquest and colonization of the Americas and other areas, and the African slave trade. Federici shows how the Witch Hunt, along with other brutal policies of the European rulers, the nobility along with the Church and mercantilists, damaged both men's and women's rights, forcing them into new work relationships, and how this same ruling class spread their mayhem around the globe, stealing lives and resources. I believe that Federici's analysis of these cataclysmic events of four centuries explains why women are so ignorant of our bodies and have so little independent control over our bodies, whereas in ancient times, effective birth control methods were known and used among women in general and midwives in particular. It shows that we can reclaim this knowledge. Working together, we can undo the harms that were done to us. Fully understanding this history as Federici tells it reinforces my belief that all women and all people of color who descend from colonized and enslaved peoples have every reason to blame capitalism and its exaltation of patriarchy for past atrocities and their present oppression. I also believe that if white men of ordinary intelligence understand how capitalism is wrecking our planet today, they will also blame capitalism and they will see that racism and sexism is keeping humankind from taking effective action against capitalism. I urge you to read this book. I already had a general understanding of history, but Caliban and the Witch has helped me to interpret and understand it better and provided me with a road map on how to bring about social change. I'm hoping to inspire you to run right out and get it; I've written a summary which I am attaching (see below). After you read it, please let me hear back from you. About the author: Federici has the chops to write this book. She worked with Wages for Housework in the 70’s, then with others to write books and articles about the transition of feudalism to capitalism. The first edition was published in 2004. She taught in Nigeria for 3 years, during which time she witnessed the Structural Adjustment imposed on the Nigerian economy by the World Bank and the International Monetary Fund that selectively impoverishes the country for the enrichment of the few. She recognized that this was similar to the way that European nobility, along with the Church and the mercantilists, accumulated capital. Summary: Disclaimer: This is a greatly simplified summary. Federici reviews and quotes from many studies of European History in the Middle Ages and the Renaissance. Over this 4 centuries, there were ups and downs and complexities. I have attempted to contact her, but I have not yet heard back from her. I urge you to read the book to absorb all of the information and analyses. Federici recounts the cataclysmic events in the Middle Ages in Europe. The Black Death killed off a sizable proportion of the population. Famines reduced the birth rates, and there was a scarcity of labor, causing wages to skyrocket. These dislocations created conditions that resulted in serfs’ revolts in the Middle Ages, Federici sees the actions of the nobility along with the Church and mercantilists to impoverish the feudal workers as a counter-revolution against the people’s uprisings to tear down the fences, and protests to demand redistribution of the land. This counter-revolution was a many pronged attack. They gave wages to male workers who then had the power to force the unwaged (females) to perform the social reproduction which enhanced the productivity of the waged workers. Federici also characterizes this a primitive accumulation of capital. This term means “how the rich got their money in the first place”. Turns out it’s not because they’re so smart or worked so hard, but because they used force to take people’s lands and their labor away from them. In the case of the Witch Hunt, it means many things: Among them, it destroyed the knowledge that women had amongst themselves about how to prevent pregnancy, so they produced more children who became members of the work force. They burned old and poor widows or single women who had been forced to beg, thus acquiring what little belongings and land that they might have. They terrorized women and kept them from moving about freely or traveling or meeting. In the case of enclosing the commons, it took resources away from the serfs and peasants because they couldn’t graze their cattle there or hunt in the forest or fish in the streams. Therefore they either were forced off the small plots of land that they held under a feudal agreement with the noble and became vagabonds or went into the city to work for wages or worked agriculturally for wages. All these moves resulted in increasing the wealth of the already rich. Federici recounts how the European ruling class then used its increased wealth to finance exploration of other lands, resulting in their “discovery” of the Americas. They then sent armed expeditions to Latin America where they killed many thousands outright, enslaved others and forced them to dig out the silver and gold they found, which they sent back to Europe. Prior to this, European wealth was primarily land, cattle, horses and valuable objects. The influx of precious metals made a monetized, capitalistic economy possible. This in turn enable the ruling class to build an infrastructure, fund institutions, fuel the industrial revolution. She recounts the brutal enslavement of the people in the Americas where people, male and female, were beaten, often to death, to force them to work until they dropped. It wan’t until the slave trade was slowed down that there was any concern for maintaining the life of the slaves and attention was turned to reproducing new slaves. She talks about how the Witch Hunts were conducted in the New World with the same ferocity with the cooperation of the the Church, both Catholics and Protestants. Indians were characterized as devils. Witch Hunts continued to be conducted in other colonies, such as India and Africa, and in the New England colonies. She has lots of details about how many features of our so-called modern industrial way of life came into being. She also shows how the capitalist expansion reinforced patriarchal organization, reduced women’s power, both their reproductive power and their ability to move around in society and have independent agency. Such “modern” features as racism and the various uses of prostitution at different times and places are included. The science of demography was invented; the study of the birth and death rates, and especially what causes the birth rate to go up and down so that the policy makers can influence it through “carrot” and “stick” measures.